I've said before, and I'll stress it again, I'm not a muso journalist. Buttttt Hannah Darcy, radge Queen, was on form with her angry acoustic guitar clashing with her beautiful vocals. Tissue Culture, who describe themselves as shouty stroppy bairns, use some great shouty guitar noise dark, alongside some beautiful melodic light. 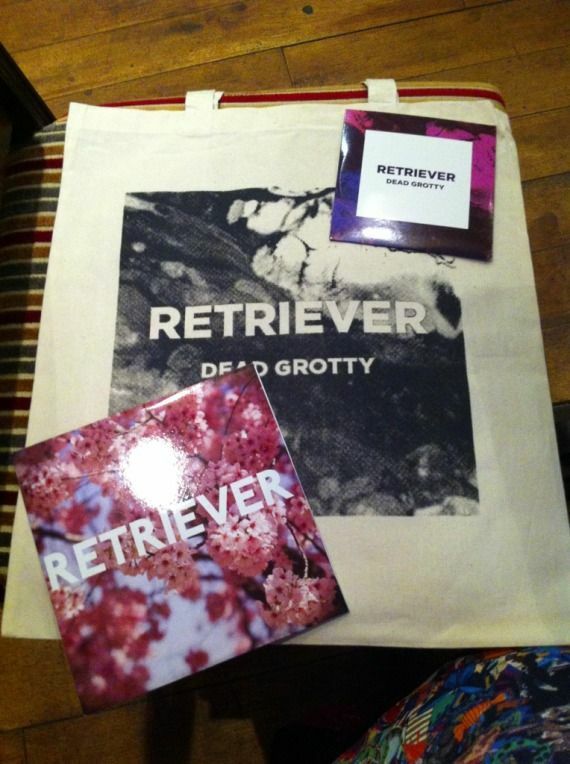 Retriever were a 3 piece and a drum machine, who have developed into a 4 piece, no drum machine. I danced and bopped and just made a bit of a fool of myself really! There was a whole thing about being on a date by accident - but that didn't stop me giving the bands the love they deserved - I think Hannah might have got a little bit more than anyone deserved, but never mind! Now, you're going to a DIY venue, and really don't know what to expect... so you wear something that is an assault to the visual senses, don't you! 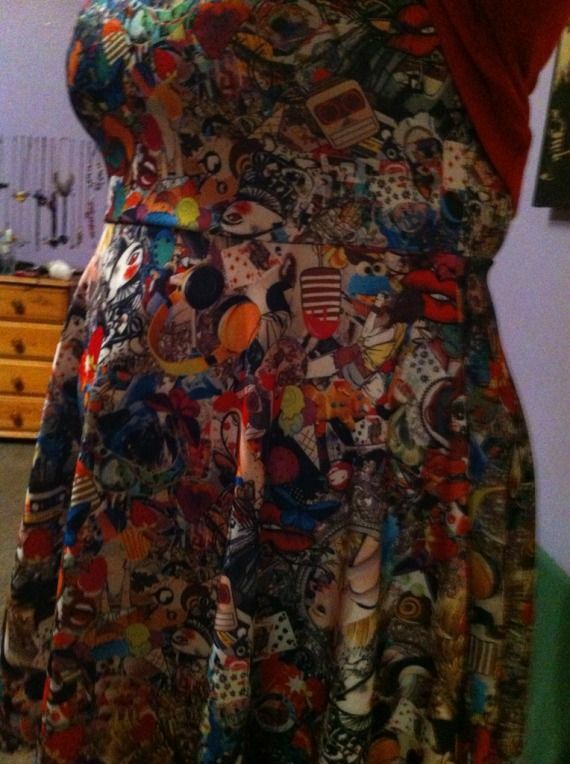 This is the cartoon / 80s print dress from Sorrento Plus. I LOVE that this print is so intense, I've not really looked that closely at it yet. It's like a magic eye picture that look at from the corner of your eye! 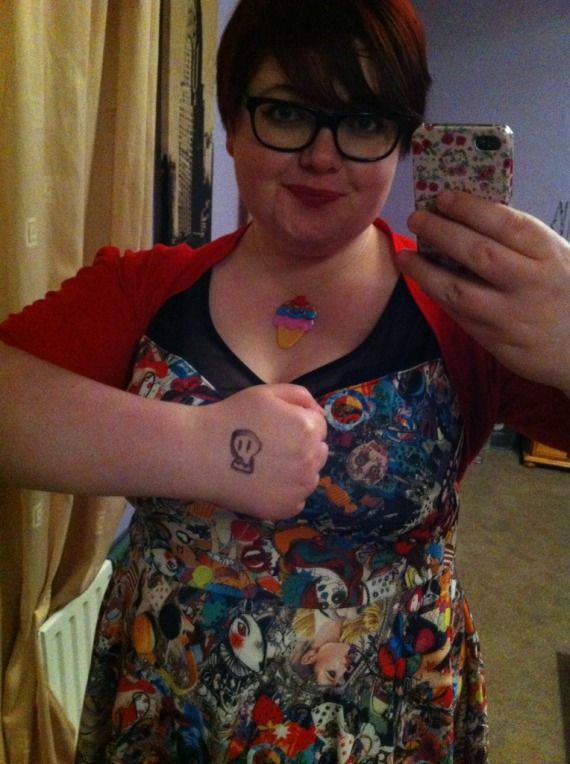 And this was me back from the night out - a little skull as a gig ticket - perfect! Dress looks good on you but the shrug doesn't work. Please invest in some cardigans as a cover up if you're ashamed to show your arms (which you shouldn't be but you never seem to show them so can only assume you are) You keep ruining amazing outfits with ugly shrugs. I'm not a troll. I follow you on twitter but don't have an account I can log in with. I can't believe people are saying I'm hateful. I complimented the dress but gave an honest opinion on the shrug. If I was hateful I'd have said you looked awful. If you can't take constructive criticism don't have a blog. Do you just want sycophantic pandering 100% of the time? Claire. I'm actually called Claire, not "Claire" and I don't appreciate being berated on your Twitter feed and talked about like I've been nasty. I am not against shrugs, they just look too bulky on you and are ruining the cut of the dresses and outfits you wear. Surely you can't have a blog and expect people to think your outfits look great but the time? I have complimented the dress and how it looks on you but my opinion is that the shrug spoils in. Please stop having a blog if all you want is people to agree with you. Where it says select profile, I cannot select a profile as I don't have one. I am going to check the other options to see if I can make this content less anonymous! I don't even know what Word Press is. I don't think it's very nice that people are saying awful things about me on Twitter simply because I don't think something you've worn is aesthetically pleasing. It's bullying. Claire. To Calire: I dont think that just beacause a person is running a blog, they are automatically asking for their readers opinion, and you Clare, are not being nice or honest when you are dishing out critisism. 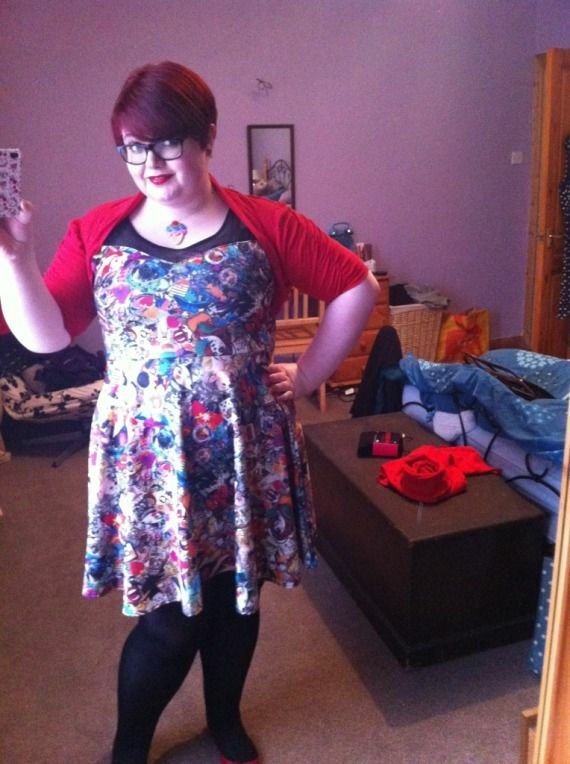 The fact that you compliment the dress does not give you the right to slag something else off. Kathryn have not asked for your fashion advice or opinion, so why bother with your opinion of how "the shrug spoils" her outfit. You would not go up to a person on the street and say "Hi, I like your shoes but your jacket looks awful". No one asked for your opinion here, and if u got nothing nice to say, then dont say it at all! Kathryn are not here to provoke, agitate or to gather the publics opinions about her clothes - she is simply showing off outfits to other people who appreciates fashion. Respect that and stay away if you cant help but commenting. Did it ever cross your mind that maybe Kathryn thinks that the shrug looks absolutely smashing together with the dress and just wanted to show her brilliant outfit to her readers? I really like the print of the dress. After reading the TL it seems that Kath is of the belive that I have the immaturity to write insults on her blog anonymously. Itronically somebody says that writing ashamed on a blog post is too far yet Kath did this to me yesterday. If i want to say my ooinion I will say it with the conviction of my name behind it. Whatever claire thinks about the shrug is not true in my opinion I like shrugs and I dont think it spoils any outfit unless is the colour of poo and vommit wth pellicans on! You and your twitter mates said i should take criticism but it seems that this is a weakness of yours too. Perhaps claire has given u some perspective on what its like to recieve unwarranted abuse. I hope u come to your senses and realise that I am a decent person who wants to write what I like and have an opinion which has as much right to be respected as yours. Woah, I did not give unwarranted abuse! I was not abusive. Just because I think something doesn't suit something doesn't make it true or untrue. It's an opinion. I think a shrug can spoil a dress, you don't. Neither of us are wrong or right because it isn't a provable fact. I have no interest in any other dispute, however, and I have consciously not involved myself in any, despite Kathryn being a personal friend 'offline'. So I wouldn't want my comments here to be drawn into anything else, please. Love the dress, think I will get that for me. How's the sizing as I have never used that site?